In Hardelot - Equihen you can choose from two types of accommodation: apartments and holiday homes. The apartments, which were completed in 2015, are situated in several buildings (low-rise, max. three floors) at the beginning of the park. You can choose from a 4-pers. apartment with one bedroom (FR-62224-10) or a 6-pers. apartment with two bedrooms (FR-62224-11). The other sleeping areas can be found in a sleeping corner with bunk bed. The apartments are furnished comfortably and in perfect order. The connected holiday homes are in a separate part of the park. There are four different types: a 6-pers. house with side sea view (FR-62224-02), a 6-pers. house with front sea view (FR-62224-03), an 8-pers. house with side sea view (FR-62224-04) or an 8-pers. house with front sea view (FR-62224-09). 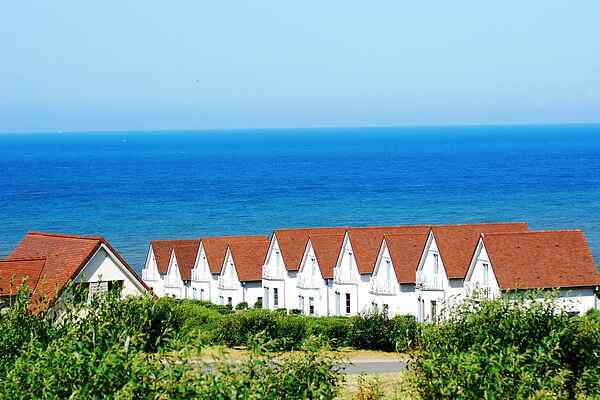 Sea view means that you can see the sea, but not necessarily have an unobstructed view of it. All houses have been fully furnished in a modern and comfortable way. The 6-pers. houses have two bedrooms; the 8-pers. houses have three. The other sleeping arrangements consist of a sofa bed in the living room. Because of this sofa bed, we find the houses more suitable for four and six people. All types of accommodation have comfortable box-spring beds. The houses have a garden with terrace and garden furniture. The apartments also have a terrace or balcony with garden furniture.